Conversational battle lines are drawn between a working-class, Mexican woman and the group of upper class white Americans as issues of class and race are divulged during a fancy dinner party. However, divided as they may be, the film stands behind the idea that something larger holds them together, regardless of whether or not they choose to see it. The most cathartic element of a film like Beatriz at Dinner is that it gives even the most divisive audience members various moments of poignancy and pathos on the inconsistencies within of the society that they live in, even though it fails to draw any conclusions based upon the issues it brings up. Beatriz, played wonderfully by Salma Hayek, is our woeful protagonist who finds herself trapped at the sordid dinner party. Though she is headstrong in nature and sticks up for her beliefs adamantly against the wrongs and injustices done by people like the billionaire developer, Doug Strutt (John Lithgow), she, too, cannot help being constituted as a caricature. Doug reads like an unapologetic Trump-like surrogate who boasts about his forthcomings, both in his finances and his hunting. “I have opinions,” he explains to Beatriz after she cannot recall who he is, “and because I have money, people listen.” Beatriz reads as one as well as she continuously tries to make amends for her wrongs to heal the pain of others and the world around her through her work as a holistic healer and massage therapist. However, her conversations on nature and empathic blend well enough against Doug's direct disdain for her philosophies for an added level or realism as they mirror conversations happening across America as we speak. The film is essentially about a clashing their various values as Beatriz holds contempt for Doug for his disregard for those beneath him, people and animals alike, while Doug simply wants is doing what he was made to do: to win. The world was built by people like Doug for people like him to succeed. He blatantly takes advantage of this and holds no shame for doing so, especially since it has gone on for so long. "The world is dying. We won’t be around much longer. There’s nothing we can do." There's a bit of fear about the end of the world in this sentiment, which is why he's confidently selling the idea that he can do what he pleases with the privileges he's been allowed. Doug is here for a good time, not a long time, so screw everyone else, which is a similar sentiment that the others around him hold. He, however, is just very frank about it. But even before the other party goers have even arrived, it is evident that Beatriz is at a disadvantage in this kind of setting. Her client, Cathy, (Connie Britton) who is hosting the party, even asks her if she would like to change before they get there. She declines which leads to Doug assuming she's the help. In asking her to change, Cathy means well because she knows just how Beatriz will be viewed in her own attire. She understands the socioeconomic and racial differences between women like her and women like Beatriz and she understands the assumptions that men like Doug with make of her due to him. Though Beatriz is a working-class woman with a full-time job that migrated to America legally, she's seen as no different than Cathy's uniformed Hispanic housemaid, whom Beatriz is surprisingly standoffish with due to the little amount of privilege she has over her. However, instead of attempting to bridge the gap between Cathy and Beatriz's evident differences, Cathy ignorantly pushes Beatriz back down by attempting to kindly force her to assimilate, even though it will not work because of the color of her skin. Cathy overlooks Beatriz' lack of privilege to sustain the look and power of own in the face of her peers and it's her lack of being able to accept their differences within the social pecking order that's set the scene for her dinner party that puts them at odds. Similarly to Kathy, the wives of the other both Doug and the young mogul walking in his footsteps also recognize their privilege, but instead of attempting to smother it under the pretense of kindness, they brandish it like weapons of their own with their blatantly, ignorant additions to the conversation, they just don't direct it towards Beatriz as Doug does out of respect for Cathy. "France is like a third world country. You can't get anything done there," says Chloe Sevigny's character, Shannon. Everyone laughs, except Beatriz, who just smiles in awkward discomfort. That is, until she's had it. Beatriz eventually lets the crowd have it and she is promptly kicked out by Cathy's husband. The film's overly ambiguous ending proves to show that maybe we all have a bit of Doug in us, regardless if we would like to believe so or not. Everyone is privileged in some way, but what matters the most is how we deal with our differences and move forward productively. 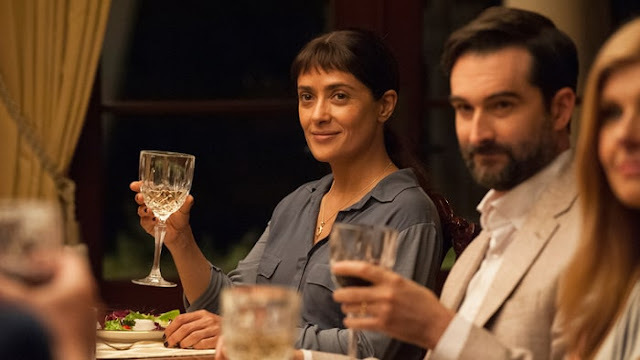 Beatriz at Dinner goes to show that we still have a long way to go before that can actually be achieved, but it also makes one ponder if we'll ever be able to do this and more importantly, do we really want to?